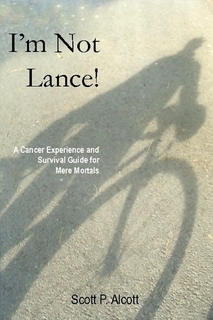 Buy the book to help research on cancer! Dear Friends, after sharing a poem on this site, many of you encouraged me to write a book about our shared experience which I’ve done. I’m Not Lance! will be on Amazon.com and in New York area stores around Christmas. 100% profits will be dedicated to the Liddy Shriver Sarcoma Initiative and some members of this forum are thanked and recognized in the book. Since it’s for charity, I’ve also arranged for electronic/rights free online distribution. You can buy a physical copy ($15) or download instantly from the below site ($5). The book dedicates a page to the Liddy Shriver foundation, asks the public to support it and states my own commitment to donate this book’s proceeds. I hope you will share I’m Not Lance! with people in our community and I hope it helps the cause. You can see the book here now and Amazon.com shortly. I hope you like it! This entry was posted in VK posts and tagged Cancer, English. Bookmark the permalink.